School starts on Monday! Hallelujah! We had a great Summer and not having to set an alarm was amazing. But, I’m happy for my son to get back into a more structured routine so I don’t have to worry about what he’s doing (or not doing) all day while I try to get my work done. This week I’ve put some easy back to school meals on the menu to help us ease back into our school routine. Back to school can mean busy nights trying to get homework done and rushing around to practices. Two of the tools that help me easily get dinner on the table are my Slow Cooker and Instant Pot. This week my son requested mashed potatoes so I’m making a Pork Roast in my slow cooker because it goes perfect with mashed potatoes. I’m also using my Instant Pot to make Mongolian Beef. It’s one of my son’s favorites. The Instant Pot makes the meat so tender and creates the most delicious gravy. Another tip to make your back to school meal planning easier is to include a leftover/breakfast night. I hate wasting food so having a leftover night at the end of the week helps us finish up all the meals I’ve cooked. For those weeks we don’t really have anything leftover we’ll usually have breakfast for dinner. It could be anything from omelets to cereal. We usually call those nights fend for yourself night so everyone just picks what they want. The weekly menu is a word doc so you can download and make changes to suit your needs. Just click on the image below to download, edit and print. 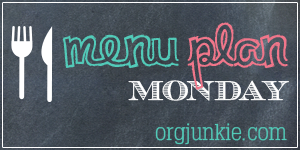 I’ve included the regular menu format and the LIIFT4 Meal Plan Template.